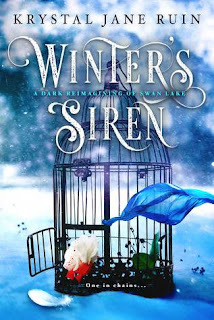 The last novel I finished reading was my writing friend Krystal Jane Ruin's second novel Winter's Siren. Upholding blog tradition, I bugged Krystal this weekend with some questions about her book and she was gracious enough to answer them! Winter's Siren was released on November 1, 2017, and is currently enrolled in the Kindle Unlimited program. For the last five years, Fawn has been the star soprano of a secluded opera house, forced to sing for her kidnapper. His daughter, Devi, waits patiently in the shadows, hiding a face so horrible that no one who’s seen it will look at it again. As Fawn plots her escape, whispers spread through the shaded corridors of dark sorcery, warning her that she must flee by the next opening night. But when Fawn draws close to the exit, it’s Devi who’s standing in her way, leading Fawn to suspect that Devi has something to gain if she fails. Sunflower: Winter's Siren is a retelling of Swan Lake. What made you want to retell Swan Lake in this dark fairytale style? Krystal: I'd been dying to do something in a fairytale stye and had been trying for a couple of years. But I didn't think about retelling Swan Lake specifically until I saw the ballet for the second time after seeing the movie Black Swan. I just thought, "I HAVE to do something with this." The story is so mystical and fascinating, and the movie helped me see that I wasn't giving myself enough freedom in my other retelling ideas. Those had all fallen apart because I kept being too literal, and that just wasn't working for my brain. Winter's Siren is really different compared to your first book--not only in subject matter and tone, but with two first person POVs! I thought it was really effective in showing the reader what was going on as the story flowed, but also in tugging at the reader as to who they were rooting for. Did that POV come about from the beginning? Thank you! It did actually! I'm not sure I ever thought about telling it from a single POV. I hadn't done dual first person in a very long time, but I couldn't see this story any other way. They were both talking and poking at me, so I had to go with it. Poor, poor, poor Devi, born with that cursed face. And poor Fawn, too, kidnapped and taken to this remote and creepy but magical opera house. Did both of the girls come to you fully formed or develop as the process went on? Is one an antagonist in your view or are they both (I think) equally protagonists and antagonists? I know right! That was totally accidental, but also totally unsurprising. I'm crazy obsessed with The Phantom, and I love the music to Wicked so much I rewrote a large portion of the plot in my head. Haha. I didn't notice the Wicked aspects until you said something. But I did notice the Phantom elements pretty early on. The cover is amazing! You said on your blog that you went through a few concepts, right? How did you settle on this one? Yep! The other cover ideas matched my personal style more, and would also match my other book more, but as soon as I saw this one, I had to have it. The first concept was darker overall and had these gorgeous teals. It was also really good, because my designer is the best, but I just felt like I couldn't live without this one. I literally thought, "I must have that or I'll die!" LOL! And like you pointed out, the tone is so different, so I figured the cover could also be vastly different than what I would normally go for. Thank you to Krystal for answering my questions! 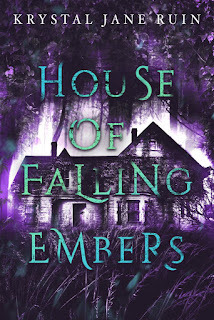 Krystal Jane Ruin is the author supernatural & paranormal fiction and a rabid fan of hourglasses, daggers, and all things Titanic. You can find her on her YouTube channel or on her blog, The Narcissistic Rose. This does have an awesome cover! I hear "opera house" and my mind goes to Phantom.